An agency or an individual, whoever wants to contribute to the greener world, do it today for a better tomorrow. The Daily Green blogs, Green Earth Organizations, non-profits, organic and ecological projects, you name it and Eco Recycling theme will help you realize it. Kick it off with the right theme and see first results within minutes. The flexibility and user-friendliness of Eco Recycling nature theme give you an endless amount of options. Create unique and complex page layouts or keep things simple and straightforward. No matter which path you choose, you always reach professional levels with a strong emphasis on what you do. Eco Recycling nature WordPress theme comes equipped with plenty features and eight predefined demos. Premium Revolution Slider plugin, custom PremiumCoding page builder and a one-click demo content installer are all included in the theme bundle. Creating, managing and maintaining a website powered by Eco Recycling theme will be hassle-free. If you are looking for a powerful nature WordPress theme, look no further. All your ideas and business plans for saving the nature just got sorted out. Your ecology projects should be presented in a manner it is appealing to your visitors. Eco Recycling nature theme has 20 different types of grid portfolio options. You can choose between 2 columns, 3 columns and 4 columns options. You can set whether you want to show the title, excerpt and whether you want a classical view or masonry view. Whichever option you prefer, Eco theme has it all. Whether you are presenting your new projects or simply notifying your visitors about your new ecology conference, you need to send a clear message to everyone. You can create beautiful presentations within minutes to let your users know about your next big thing. The complete Changelog can be seen at the end of the description. We prepared another preview/demo that some customers wished for. Finally, Eco Recycling theme also has a beautiful boxed layout. Click on the image below to see it in action. The main color is set in your #1 nature WordPress theme’s options with the convenient color picker. There are no set limitations when it comes to choosing colors anymore. As a result, set the color you want that suits your branding and save the settings. Carefully crafted Eco Recycling nature theme comes with a special one click demo install. It allows you to install the demo content quickly and efficiently, without any XML files. Furthermore, it is advised to use this demo importer on a clean WordPress installation. No more XML files and tedious demo installations. Simply set whether you wish to import Revolution Slider and Widgets and you are ready to go. As a result, the look of your website can be the exact same as your favorite Eco Recycling nature theme’s live demo. Bear in mind, feel free to improve it and add your personal touch to the web design. Customize the theme per your request and stand out from the crowd. Eco Recycling theme is powerful enough to undergo any customization tweaks you perform. Eco Recycling theme uses a brand new Page Builder developed by our small team. We completely revamped our old page builder and made it more user-friendly and much more versatile. Pages that you build are split into three sections; header, footer, and body. Meaning, you have unlimited possibilities of what to add to a certain page and its section. Combination of shortcodes and blocks enables you complete freedom in building your page (color and layout wise). With your imagination, you can use the best nature WordPress theme to its full potential. Eco Recycling is fully responsive and retina ready. It will look gorgeous and fluently adapt to any mobile device. Eco Recycling ecology theme uses an advanced AJAX loading of the Projects and Posts on the front page. If you click on one of the Projects it will open live on the Front Page. From there you can choose to either close it or read it in full details. A user will then be taken to the single static page of the recent Project or Post. With this functionality, a visitor can easily check all the Projects and Recent Posts. And the best par? They do not have to leave your nature-first website’s, Home Page. Create a responsive – mobile friendly – or full-width slider with must-see-effects. Besides, keep and improve your theme’s SEO optimization. For your information, all Eco Recycling nature WordPress theme’ content is search engines compatible. Let it be a slider, an introduction page or an article. See the heaps of custom transitions and animations for each object on the page! Customize this slider with our convenient drag & drop backend to your very needs. Revolution Slider features tons of unique transition effects, an image preloader and video embedding. The WordPress plugin has an autoplay that stops on user’s interaction and lots of easy to set options to create your own effects. In addition, you get Video Tutorials to help you get started with the Slideshow. Also, please note that you will get the demo .txt file to recreate the same Slideshow as in Live preview in seconds. Apart from the design, it’s also the plugins that you choose that make your blogging experience so much better, and Eco Recycling proudly supports all known and popular WordPress plugins commonly found to be used by the average WordPress website: Contact Form 7, Facebook Widget, Instagram Feed, MailPoet Newsletters, Recent Tweets Widget, Shortcodes Ultimate, Slider Revolution, Essential Grid and many more. We offer professional customer support via ticket system. Please write through the contact form on my profile or via support tab in theme’s description and your email will get into our support system. Hit the link below to get in touch. 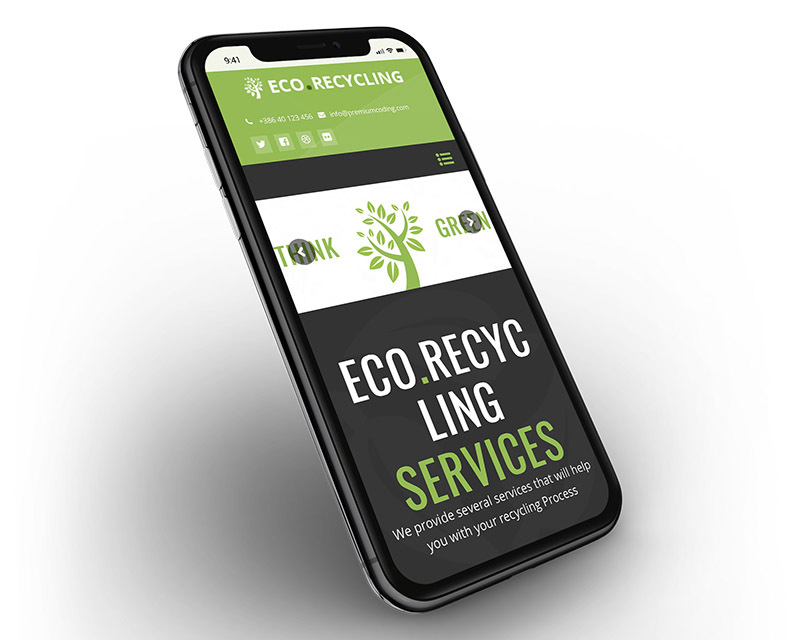 Eco Recycling nature WordPress Theme is designed specifically for Environment Protection companies, nature-related websites, for non-profit organizations and animal-saving fundraisers. Theme is also included among the best nature WordPress themes on Colorlib (the biggest WordPress blog out there).